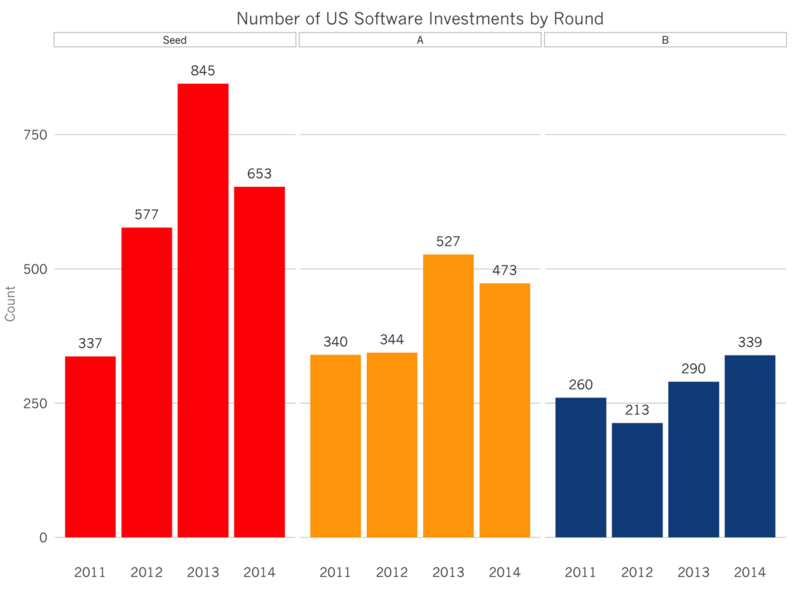 845 software companies raised seed rounds in 2013, a 40% increase from the year before. But in 2014, that figure fell by 25% to 653. Meanwhile, Series As remained roughly constant from 2013 to 2014, and Series Bs rose by about 17%. In aggregate dollar terms, the seed market remained flat at about $700M. The Series A market, despite a 10% decline in deal counts, grew by about 5% to $3B in 2014. The Series B market exploded to $6.5B last year, growing by 66% annually, after having grown by 77% the year before. The typical SaaS/software company raised a $1.1M seed round, a $6.4M Series A, and a $19M Series B. Each of these round sizes increased year over year. The Series B rounds increased by more than 40%. The deluge of dollars flowing into the venture market seems to be fueling Series B rounds primarily. Total investment has doubled, driven primarily by larger rounds in roughly the same number of companies. In other words, the early market leaders are rewarded handsomely with larger investments at better terms. This concentration of dollars in the Series B market, driven by competition, continues to drive valuations and multiples ever higher. And consequently, if multiples were to suddenly recede, it would be the Series B rounds that would likely see the greatest fall in size and investment pace.